While part of the studio is working on The Walking Dead: Season Three, another part of Telltale has decided to break from their original characters and explore a popular character from the comics. The Walking Dead: Michonne explores the titular character, after she leaves Rick's group following the events of All Out War. In doing so, they've managed to make the character and situation enjoyable even without knowing the source material before hand. The game opens with Michonne having flashbacks about the traumatic events that happened to her at the start of the zombie apocalypse. She is then brought back into the present by Pete, a fisherman who she befriended sometime after leaving Rick's group. The game focuses on Pete and Michonne after they hear a distress call on the radio of Pete's ship, The Companion. Of course, this being the universe of The Walking Dead, deciding to help people isn't always an easy choice. At this point in the story, it's a few years into the zombie apocalypse, and as explored in Telltale's The Walking Dead: Season Two, the constant threat of death has brought out the worst in many people. The story is the best part of The Walking Dead: Michonne. It's exciting, and the characters are all entertaining in their own right. There's a mysterious nature to each of the characters, but unlike the second season of The Walking Dead, there isn't an overabundance of characters. The layers of mysteriousness for each character are slowly pulled back, revealing more about each of them, even in the first episode. With this being a three episode miniseries, hopefully Telltale will manage to continue this. This episode is quite short, but there is a lot of story packed here in that short playtime. The presentation is also top notch. The team has come a long way in terms of presentation, with Tales from the Borderlands being a real turning point for the studio in this regard. The Walking Dead: Michonne continues on this trend, with excellent choreographed action scenes and a fantastic opening sequence. The voice actors are also excellent. The voice actress for Michonne, in particular, is a real standout. Michonne is a character who has been hardened by the events of the apocalypse, and it really comes across in her performance. The rest of the voice cast compliments her performance just as admirably. The musical score is also excellent. The choice of music for the opening number is fantastic, fitting the scenario of the game excellently. The original compositions are also equally fantastic, helping to set the tone of the game beautifully. Unfortunately, the game play itself doesn't shine quite as much as the story and presentation. It's a shame that after Telltale had shown that they could improve their formula with the direct controlled combat in Minecraft: Story Mode, they are right back to being solely driven by quick time events as in The Walking Dead: Season Two. It also lacks the branching locations of The Wolf Among Us, or the optional puzzles of The Walking Dead: Season One. The presentation of the quick time events is given a shiny new makeover, making them look nicer than ever. However, when they are the crux of the gameplay, with no alternative offered, they begin to become tiresome. The choices and consequences do seem like they might be interesting this time around though. There's already one major choice that can be made at the end of the episode that has immediate consequences. Time will tell for the other choices, but the intense situation that Michonne and Pete find themselves in could definitely make for some major consequences in future episodes. Telltale manages to tell a fantastic story in the first episode of The Walking Dead: Michonne. They backed that up with a fantastic presentation, excellent voice acting, and fantastic music. There is already one major consequence to the choices in this episode, and while there aren't too many others, the intense story could mean that there will be more major consequences as the mini-series continues to unfold. Unfortunately, while the story and presentation really shines, the gameplay itself is a bit lacking. The action scenes are choreographed beautifully, but when the sole means of action is solely prompted button presses, it quickly becomes quite tiresome. It's a shame that Telltale has gone back to relying solely on quick time events after showing that they can do so much more. After a short episode that felt like it was just the build-up to future episodes, the third episode of Minecraft: Story Mode delivers with an excellent episode that lives up to, and in many ways, exceeds expectations. In this episode, the Order of the Stone is reunited, and the Wither Storm threat is ready to be dealt with. However, things aren't as simple as they seem. The story really begins to take form here. The setup for the story was interesting, but it did seem like a standard wish fulfillment story. It still is that, of course, as it is inspired by family films of the 1980's such as Goonies and Back to the Future. However, this episode has taken that formula, and twisted it a bit. Our would be heroes are given a lot more to work towards to achieve that dream. In addition, the choices made in the previous episodes affect the story more here than before, and there are finally some real consequences to the choices. The characterizations here are great. Both the reunited Order of the Stone and our young heroes are given time to shine. It's really fun to see these two factions finally get to spend time together. Our heroes are big fans of the Order, and that still shows. But, in their conversations with the Order, they've shown that already grown up a lot since the first episode. The two factions converse largely as equals, and that makes for a really enjoyable moment. The voice work of the cast, of course, has a lot to do with that enjoyment. Everyone here delivers some of their best work of the season. Both Patton Oswalt and Catherine Tabor deliver great lines as Jesse, and, as always, and the supporting cast is great as well. Depending on your choice in the first episode, you will either have a full Order of the Stone, or a complete set of people in Jesse's group. These optional people are among the highlights of the voice cast in this episode. It's worth playing through both just to see the different interactions between the two factions depending on who you have on your team. I've enjoyed this season a lot as it's been bringing classic puzzles back in Telltale games, and combining them with choices and consequences gameplay quite nicely. As I alluded to before, the choices and consequences system here is finally starting to pay off with some real consequences to your choices. The puzzles also shine here. This episode has one of my favorite puzzles so far, in the scene where the group searches for the remaining member of the Order, Soren the Architect. The puzzle is also accompanied by a fun little song that is presented in the style of a 1920's recording. The entire sequence reminds me of one of Telltale's Sam & Max episodes, which is definitely a good thing. On the subject of music, Anadel continues to deliver here. The entire game has a retro feel to it, from the story, to the blocky graphics of the Minecraft world, to the choice of 1980's stars as the supporting voice cast. The soundtrack fits that just as well. As we're getting farther into the story, and our heroes are getting into more danger, the tone of the music is adjusted to suit that as well, but still manages to continue the synthesized music style that worked so well in previous episodes. The third episode of Minecraft: Story Mode really shows that this series has staying power. The second episode felt just like a build up to a bigger story, but now that we're knee deep in it, that setup was worth it. The story gets a major twist here, and the characters are fleshed out more than ever. The voice actors deliver their best performances of the season. Plus, the art and music continue to work well, conveying the retro feel which the story is striving towards. The choices and consequences are finally starting to have a meaningful impact, and the puzzles are among the best of the season so far. The game is a great merger of classic Telltale, with puzzles, and modern Telltale, with choices and consequences. If the season continues on the track it is now, it can very well end up being among Telltale's best games. Telltale updated their blog with Minecraft: Story Mode news. Episode 5 will be releasing on February 29th. Then three new episodes will be released as downloadable content that can be purchased on the platforms supported by the game. The DLC episodes will be released over the course of this year. Also, Mashable revealed, in an article with Telltale's CEO Kevin Bruner, that The Walking Dead: Season Three will begin releasing some time this year. More news will be revealed about Telltale's third season of The Walking Dead when Comic Con International occurs between July 21st and July 24th. Day of the Tentacle Remastered is now available to purchase for Windows and Mac from Steam, GOG.com, and The Humble Store. Your purchase at those stores will also get you a Linux version, but this version will be coming a bit after launch. It's also available on the PlayStation Store for the PlayStation 4 and PlayStation Vita. Telltale's South by Southwest Batman panel is now online for all to see. Some interesting things have emerged from that panel. Players will play as Bruce Wayne more than usual in a Batman game. In many situations, there will also be a choice between confronting a situation as Bruce Wayne or going all in as Batman. As Batman, you'll also be given a choice to physically harm a suspect or take a more diplomatic approach through interrogation to get the information you're seeking. You won't be able to play the whole game without becoming Batman, but the developers have stated you should be able to play a large portion of it as Bruce if that's the way you wish to play. It is going to be similar in approach to their The Wolf Among Us series in terms of artistic presentation. It will be set in its own universe. Although it will draw from the 77 years of comic lore that already exists, the team will be able to make their own mark on the iconic characters. It will have an art style inspired by DC artists such as Jim Lee, Greg Capullo and Neal Adams. It will have an M for mature rating, will consist of five episodes, and will begin releasing this summer. I decided to get back into video editing, and thought of a fun idea. Both The Wolf Among Us and Night Court involve trials held in the 1980’s, so I thought it’d be fun to mash them up. Additionally, there are new ports for GCW-Zero and Raspberry Pi. The graphics subsystem for the Sierra AGI engine has been overhauled, and the SCUMM engine has also received some love. The original Maniac Mansion walking code for the V0 and V1 version of the game has been implemented, Maniac Mansion can now be played from within Day of the Tentacle, and lip sync animation has been improved in later Humongous Entertainment games. There's a whole lot more new with this release, as it's been a long time coming, so head over to the ScummVM site and give it a spin. The Day of the Devs lounge is coming. This event, an incarnation of the Day of the Devs event that is held jointly by Double Fine and iam8bit, is being held this year at the Game Developer's Conference. There will be a Day of the Devs lounge that, according to the GDC event schedule, will be held every day of the convention (from Monday March 14 to Friday March 18) from 10AM to 5PM PST. So, if you're heading to the GDC, make sure to stop by the Day of the Devs lounge to play Day of the Tentacle Remastered for yourself, and give the other games a try while you're at it. Update March 14, 2016: I corrected the chronology of the game, thanks to input by cheeseness. 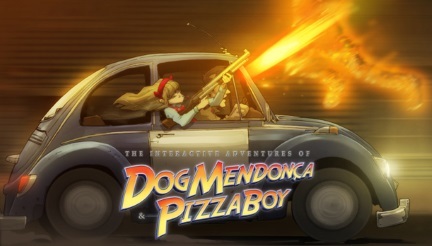 The Interactive Adventures of Dog Mendonça & Pizzaboy is an adventure game based on the graphic novels which take place in a world where monsters are real, and they live among humans. Chronologically, it takes place between the first and second graphic novel, when Pizzaboy is still with his girlfriend, Ana. An overweight werewolf named Dog Mendonça acts as the in-between between the humans and the monsters, creating the code, a set of rules which prohibit supernatural beings from interfering with the lives of humans. His home town of Lisbon, Portugal has been the Casablanca of the modern world, where humans live their lives unaware of the super-powered living among them. However, if someone breaks the code, Dog Mendonça is there to stop them. However, Dog Mendonça is more brawn than brains, and has an oversized ego on top of it. To keep him in check, he has a team with him consisting of a demon named Pazuul who is trapped in a little girl's body, a gargoyle head without a body, and a former pizza delivery boy named Eurico Catatau. Eurico is the actual brains of the operation, and is the person who conducts the interviews in order to do actual detective work, rather than brute forcing their way through the sheer luck that had worked before they met him. Of course, being a human, the supernatural beings naturally have a hard time taking him seriously, Dog and Pazuul included. The investigation element is strangely the weakest part of the game, although it is the most effective at emulating the film noir style that they are aiming for. This is due to the strange execution, in which Eurico already asks the questions before the player is given a chance to take control of the situation. This results in Eurico asking the same questions again, and hearing the same first line from the suspects plus additional dialog. This makes it feel a bit needlessly clunky, and takes you out of the story. It's a shame really, as the rest of the system is executed well, with multiple questions allowed to be asked, and the ability for Eurico to go down the wrong path in interrogation. Sometimes it's humorous to watch the suspect's responses when you aren't going down the proper line of interrogation, although it's a bit tedious as you have to ask the same questions again when you do. If the game didn't ask the questions before starting, the interrogation aspect would have been a lot more fun. As it stands, since the same questions are asked multiple from the start, hearing the same questions yet again by going down the wrong interrogation path feels more monotonous than it should. Thankfully, the rest of the game is top notch. The crowdfunding pitch for the game mentioned that the developers were inspired by Monkey Island, and that inspiration does wonders for the game. There are a few instances of objects that blend into the background well, so the right click to highlight hotspots function works well to prevent frustration from pixel hunting. There is also a notebook in the pocket in the inventory menu, which comes in handy if you need a refresher on the current quests that Eurico has found himself thrust into. The puzzles are as well done as the games that inspired it, and the inventory combination puzzles are well done and never overused. There are no brain bending puzzles here, but there are a few that should give seasoned adventure gamers a few minutes pause. All of the puzzles are nicely executed, and they all fit within the logic of the game world, strange though it is. The story is also excellent, fitting well within the world of the graphic novels, yet it is executed in such a way that someone new to the series will be able to have fun with the game without any prior knowledge of the source material. The storyline is quite well done, and is a mystery that is interesting to see unfold. The game is a murder mystery, but it is full of humor. The comedy in the game takes its cues from the one-shot comic where the characters break the fourth wall, and the humor goes a bit more over the top than it does in the main series. This works well for this style of game, as adventure gaming is a bit absurd in reality, with characters with near limitless space to hold items. The characters here poke fun at that and other conventions of the genre, and are well aware that they are in a game, and are characters from a series of graphic novels. It's fun and silly, and this style of humor should resonate with anyone who is a fan of the comedic LucasArts adventure games or the humorous games of the companies who had sprung from them, such as Telltale Games or Autumn Moon. All of the voice work in this game is top notch. Every actor fits the role of the characters, and the newly introduced characters are just as fun and well done as the characters who came from the original comics. There are a few moments of strange English translation from the original Portuguese, but nothing too awkward, and the voice actors handle these moments well enough that it's not too noticeable. The music is also well done, fitting the tone of the game well, and complimenting the excellent backgrounds. The art style is easily the best part of this game, bringing the art style of the graphic novels into interactive media perfectly, and looking beautiful while doing it. There are many locations in this game, and each is as detailed as the last. It's easy to find yourself slowing down and just enjoying the scenery for a bit. There are a lot of little details in the background, including many humorous references to various adventure games and films. The characters are also just as well done, also perfectly emulating the style of the comics, making a perfect blend with the backgrounds. In certain scenes, there are also comic style close-ups, where a series of stills will be shown to emphasize the action. This works well, and further makes it feel like a natural extension of the graphic novels. It's also never jarring, as it is subtle, and its execution feels a lot like the art of Dave Gibbons in Beneath a Steel Sky. The Interactive Adventures of Dog Mendonça & Pizzaboy is an excellent translation of a fantastic graphic novel series into a fun adventure game. It is very much a classic style adventure game, with humor and puzzles inspired by the LucasArts adventure games. The puzzles are also just as well done as their inspiration, as while there are no brain-benders, all of the puzzles fit well within the logic of the game world. The story is fantastic, with a murder mystery mixed with an excellent humor that works in a world full of bizarre supernatural characters. The voice acting and music are both well done as well, working well with the story and atmosphere of the game's setting. The art style is the clear stand-out of this game, as it is beautifully translated from the graphic novel to the computer screen, with the characters looking spot on from the comic, and every location brimming with an exquisite level of detail. The only drawback of the game is the weirdly presented interrogation system, as it gets a bit tedious hearing the same question being asked multiple times. However, since these moments are few and far between, the other qualities of the game far overcome this. The story and presentation is so well done, any feelings of tedium are very short lived. It's a game that is worth playing for any fan of comedic inventory based puzzle adventure games. Shardlight, the first game designed by Francisco Gonzalez and Ben Chandler after being hired full time as developers at Wadjet Eye Games, has been released for Windows. It's currently 10% off as a launch sale at GOG.com, Steam, and at the Wadjet Eye Games store. In other Wadjet Eye Games news, Blackwell Epiphany has been released for iOS, completing the Blackwell saga on that platform. You can buy Epiphany for iOS through iTunes, or grab the entire five chapter saga as part of the Blackwell bundle.